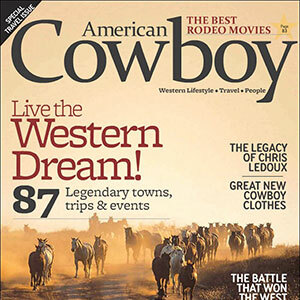 COLORADO SPRINGS, COLORADO — American Cowboy Magazine has named R.W. Hampton’s “Born To Be A Cowboy” among the Top 20 Cowboy Songs of the Past 20 Years. Other notable names on the list include Riders In The Sky, Michael Martin Murphey, Joni Harms, Tom Russell and Don Edwards. Late last year, the magazine named Hampton among the top 50 singers of all time of Country Western Music alongside artists like Johnny Cash, Dolly Parton, Gene Autry and Roy Rogers. Hampton, a multi-award winning singer-songwriter of American Cowboy Music, is currently preparing for the release of his next album, This Cowboy (release date TBA). With fans from all walks of life, Hampton is loved by cowboys, cowgirls, ranch hands and rodeo stars, as well as by people who have never seen a cow up close — or cared to. A singer, songwriter, actor and entertainer, Hampton is known for his patriotism, his family values and Christian beliefs. Hampton has lived what he sings about, and the world of early mornings, hard work, rough horses, maverick cattle and new ranges fits him. After twenty-two years in the entertainment business and over 15 national awards from his peers, R.W. is still pure cowboy; singing about what he loves best. He is today’s voice of American Cowboy Music.